(CNSNews.com) – A larger percentage of American 12th graders (79.7 percent) say marijuana is “fairly easy” or “very easy” to get than say the sane thing about cigarettes (75.1 percent), according to an annual survey of adolescent drug use conducted by the Institute for Social Research at the University of Michigan. Similarly, a larger percentage of 12th graders say they “disapprove” or “strongly disapprove” of people 18 or older who take one or two drinks nearly every day (74.7 percent) than disapprove or strongly disapprove of people 18 or older who smoke marijuana regularly (66.7 percent). It has asked 8th and 10th graders this question about both marijuana and cigarettes since 1992; and it has asked 12th graders about marijuana since 1975. However, it did not start asking 12th graders about cigarettes until 2017. For 8th graders, the percentage who said that marijuana would be fairly easy or very easy to get rose from 42.3 percent in 1992 to a peak of 54.8 percent in 1996. It then dropped to 35.0 percent in 2018. By contrast, 77.8 percent of 8th graders said cigarettes were fairly easy or very easy to get in 1992. That, in fact, was the peak for cigarette availability among this age group. 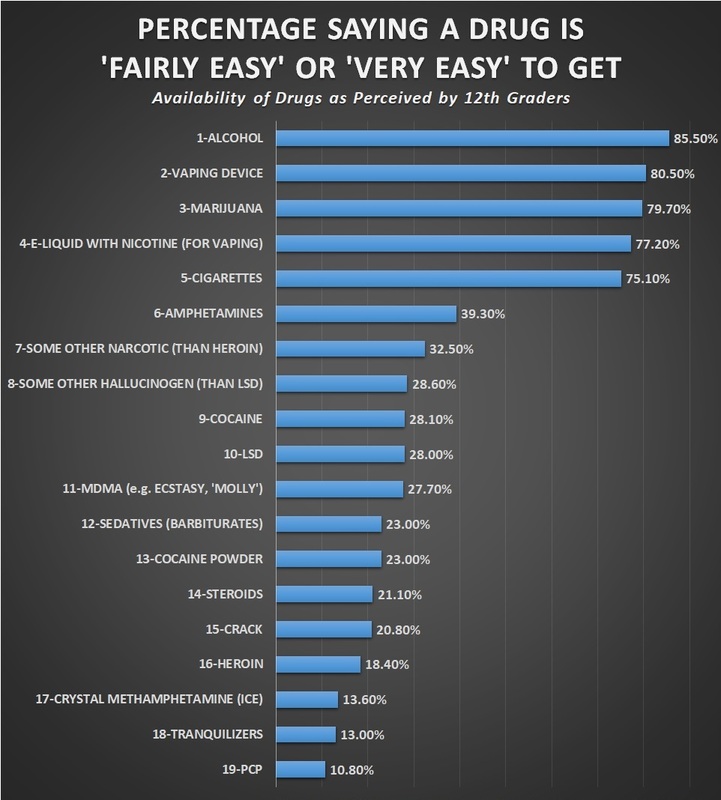 By 2018, only 45.7 percent of 8th graders said cigarettes were fairly easy or very easy to get. Among 10th graders, 65.2 percent said marijuana was fairly easy or very easy to get in 1992. That rose to a peak of 81.1 percent in 1996 and dropped to 64.5 percent by 2018. In 1992, 89.1 percent of 10th graders said cigarettes were fairly easy or very easy to get. That rose to a peak of 91.3 percent in 1996 before dropping to 61.5 percent in 2018. 2016 was the first year that the percentage of American 10th graders who said marijuana was easy to get exceeded the percentage who said cigarettes were easy to get. That year, 64.0 percent said marijuana was fairly easy or very easy to get and 62.9 percent said cigarettes were fairly easy or very easy to get. In 2017, 64.6 percent of 10th graders said marijuana was fairly easy or very easy to get and 62.5 percent said the same about cigarettes. While the percentage of 12th graders who say marijuana is fairly easy or very easy to get has declined a bit from the 1970s, it still ended up that in 2018 more 12th graders said marijuana was easy to get than said the same about cigarettes. In 1975, 87.8 percent of 12th graders said marijuana was fairly easy or very easy to get. In that year, the survey did not ask 12th graders about the availability of cigarettes. The percentage of 12th graders who said marijuana was fairly easy or very easy to get hit a peak of 90.4 percent in 1998. By 2017, it had dropped to 79.9 percent, and then in 2018 to 79.7 percent–the lowest percentage for any year in the survey. However, when the survey began asking 12th graders about the availability of cigarettes in 2017, only 77.9 percent said it was fairly easy or very easy to get cigarettes—which was less than the 79.8 percent that year who said it was fairly easy or very easy to get marijuana. Then, in 2018, the percentage who said it was fairly easy or very easy to get cigarettes dropped to 75.1 percent—or 4.6 points below the 79.7 percent who said that year it was fairly easy or very easy to get marijuana. 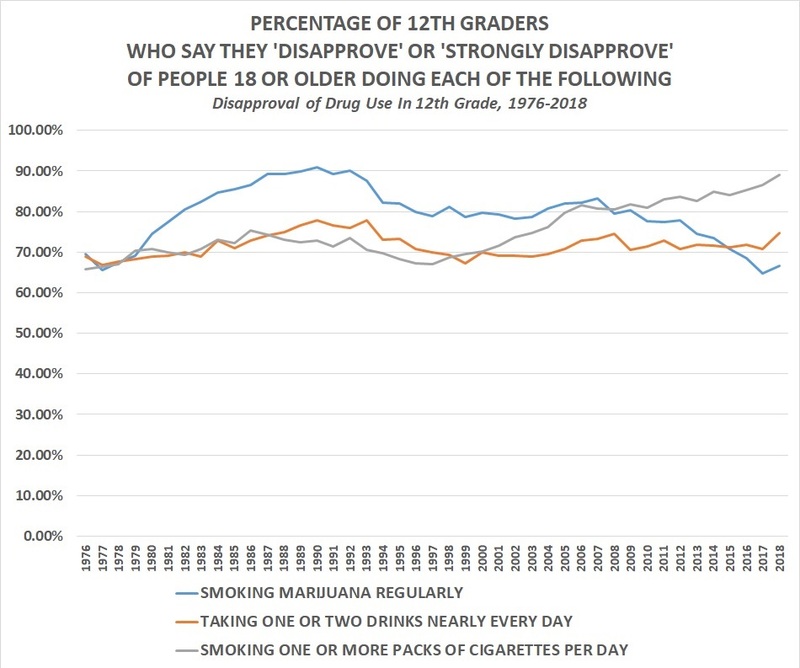 Since 1976, the survey has asked 12th graders whether they “don’t disapprove,” “disapprove” or “strongly disapprove” of people 18 or older who use various types of drugs at various frequencies. One question asked about people who smoke marijuana regularly, another about people who smoke one or more packs of cigarettes per day, and another about people who take one or two drinks nearly every day. In 1976, the percentage who disapproved or strongly disapproved of regular marijuana smokers (69.5 percent) edged out the percentage who disapproved or strongly disapproved of people who take one or two drinks nearly every day (68.9 percent) and the percentage who disapprove or strongly disapprove of people who smoke one or more packs of cigarettes per day. Disapproval or strong disapproval of people who regularly smoke marijuana rose to a peak of 91.0 percent in 1990. That year 77.9 percent of 12th graders disapproved or strongly disapproved of people who smoked marijuana regularly and 72.8 percent disapproved or strongly disapproved of people who smoked one or more packs of cigarettes per day. In 2018, 89.0 percent of 12th graders said they disapproved or strongly disapproved of people who smoked one or more packs of cigarettes per day, 74.7 percent said they disapproved or strongly disapproved of people who take one or two drinks nearly every day, and 66.7 percent said they disapprove or strongly disapprove of people who smoke marijuana regularly. While fewer 12th graders found cigarettes easy to get than found marijuana easy to get, and fewer approved of regular cigarette smoking compared to regular marijuana use, the same survey showed that there was a dramatic spike in the percentage of adolescents “vaping” in 2018. This included vaping both nicotine and marijuana. As someone who was once a 12th grader, I can vouch for this. Even in the 90’s it was easier to buy than cigarettes.